Do you like the long haired or the short haired German Shepherds best? So, you have finally decided to get a German Shepherd puppy. Could be a great choice if you did your homework ahead of time! German Shepherds, also called Alsatians or GSD, are also known for having many great qualities that one would look for in a dog. Some of these include strength, intelligence, loyalty and obedience. Squishable.com is having a vote for the topo, início dog breed that users would like to see turned into a Squishable plush! Last years winner(s) were the Corgi and the Shiba Inu, which have since been turned into plush. A plush German Shepherd could be next! A spot for the lovable German Shepard from "All cachorros Go To Heaven"
Are you eager to learn all about the German Shepherd? I want to help you be a better German Shepherd Dog owner. Click here to learn mais GSD info, various health issues, general facts and more. 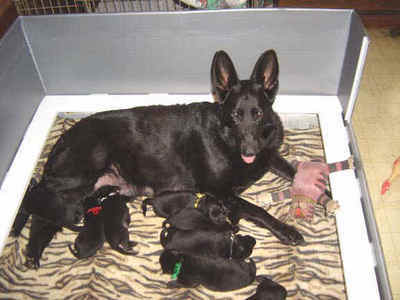 Pure black German Shepherds are called what?